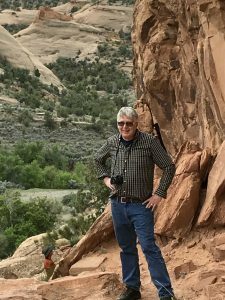 May 11, day 10 – There was no photo record of Earl and Ethel visiting Dinosaur National Monument, but we did, and took a number of photos too! The park is just off their route and there was certainly enough buzz about the place to call for a look. 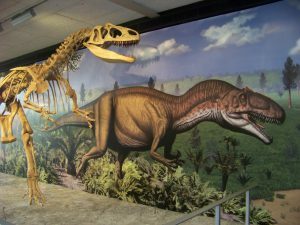 In the early 1900’s the excavation of dinosaur bones in this small corner of northeast Utah became the source for a number high caliber museum displays in New York, Pittsburgh, the Smithsonian and in Europe. 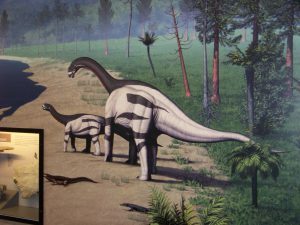 While the displays brought dinosaurs up close to large population centers, and each discovery generated new headlines, it was the vision of Earl Douglass, the paleontologist in charge, to preserve a portion of the site with the bones exposed in the location where they had laid for 150 million years. 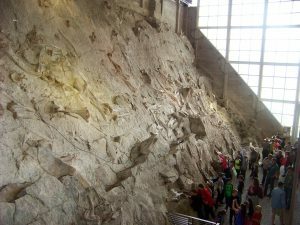 Roughly a quarter of the “quarry” was thus preserved and became the initial 80-acre Dinosaur National Monument. 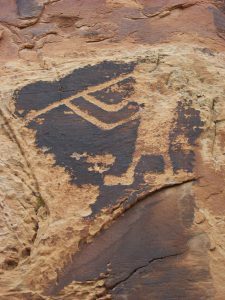 The Monument was later expanded to 200,000 acres to include natural areas along the Yampa and Green Rivers and areas with 1,000-year-old Native American petroglyphs. We loved the mural displays of the dinosaurs sporting very colorful markings. A school group from Wyoming toured the quarry while we were there. Nothing gets a 9-year old’s attention better than touching a “real” dinosaur bone. . . or 65-year old either! We went for the dinosaurs, but the petroglyphs became our favorites! 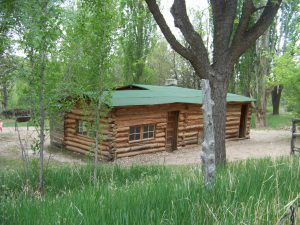 The park also includes the cabin of Josie Morris who settled in the area in 1914 and lived “a solitary 19th century lifestyle well into the 20th century” when she died at age 89 in 1964. 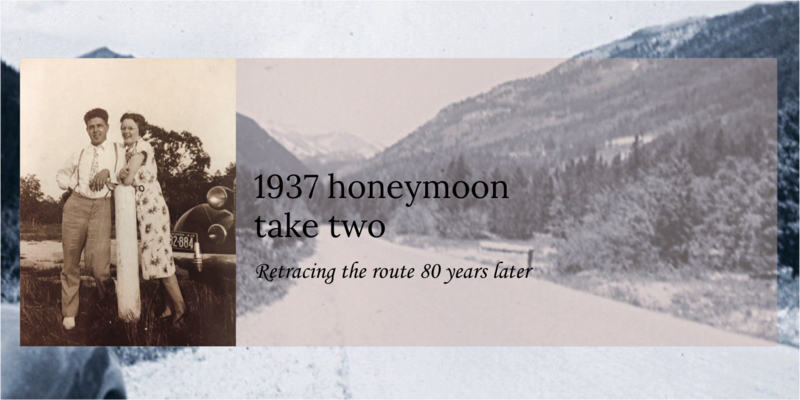 She was an alleged associate of Butch Cassidy and the Hole in the Wall Gang. enjoying your photos Carl and Lynn! What an amazing place. I am embarrassed to say I have not heard of it before. The interior looks huge – but then we are dealing with dinosaurs. Beautiful landscape. You know my first thoughts were about how much Caleb and Jack would like it – need to figure out a trip. Yes, they would like it! It was a pleasure to meet you both. Thanks for visiting the Uintah County Regional History Center. 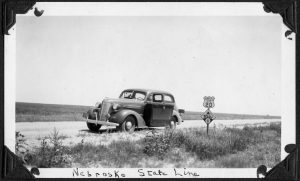 We wished that we could have identified the photo, your parents had taken in 1937 near our area. I will keep asking around. Love your story and experiences!!! What better way to enjoy the start of your retirement and anniversary!!!! Best Wishes and Safe travels!!! 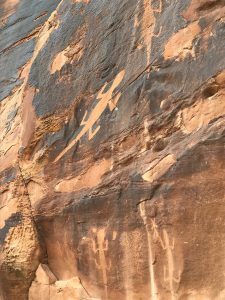 I remember being their in the heat of summer with our kids so we didn’t walk up to see the petroglyphs. I remember the Josie Morris cabin, too.